The U.S. Navy Blue Angels will return to Traverse City to perform at the 2020 National Cherry Festival. 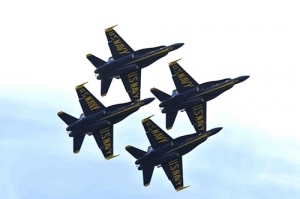 The Blue Angels demonstration team announced at the annual International Council of Air Shows this week they will perform at the Cherry Festival over West Grand Traverse Bay on July 4 and 5, 2020. The performance, which will include the Blue Angels' iconoic aerial maneuvers and high-flying formation routine, will mark the 16th appearance by the team in Traverse City.